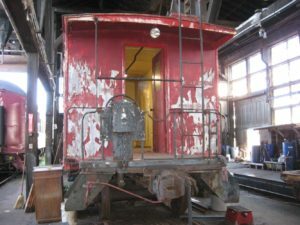 The CWR (California Western Railroad, aka The Skunk Train) Caboose #11 has been languishing in the CWR enginehouse for many years. She is in a sorry state. 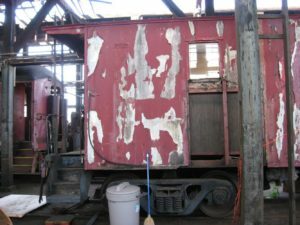 The Mendocino Coast Model Railroad & Historical Society (MCMR&HS) members are excited to renovate the Caboose to it’s original condition. It will be a challenging task for our small club. 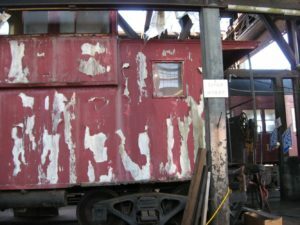 Caboose #11 was built in 1936 by CWR/Union Lumber Company employees on a Southern Pacific Frame. She was rebuilt in 1962 by CWR employees in Fort Bragg. She was retired from service in 1989 and ran very rarely thereafter. 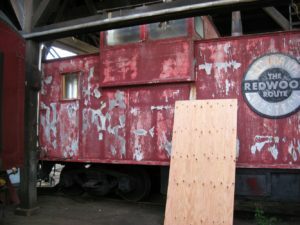 Part of our club’s remit is to try to find photos and the history of Caboose #11. This blog has been created to provide a record of the renovation. Chief electrician Jim Williams took these pics soon after we started the renovation work. As you can see the exterior is a mess. In due course what’s there now will be removed and replaced. The replacement will not be “as is” ……. to make it more passenger friendly three new windows are planned. 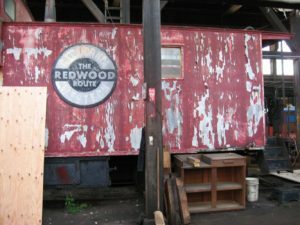 The Redwood Route insignia has been removed and will be replaced by Master Cabinet Maker Joe Cooper. I’ve signed up as chief observer!!!!!! This entry was posted in Outside. Bookmark the permalink.